The astonishing dexterity and passion for detail of American printmaker John Taylor Arms (1887–1953) was revealed in the first exhibition of his works at the National Gallery of Art, Washington. On view in the West Building from May 8 to November 27, 2011, The Gothic Spirit of John Taylor Arms featured some 60 prints, drawings, and copperplates that span the artist's career, from his early New York series to his finest images of cathedrals. Born in Washington, DC, Arms began his career as an architect in New York, but by 1919 he had dedicated himself solely to printmaking. He adapted the meticulous drafting skills required for his architectural practice to the execution of finely wrought prints. Arms devoted many years of European travel and study to rendering architecture and is best known for his print series based on particular places or subjects, including gargoyles, French churches, New York, England, and Italy. Organized thematically, The Gothic Spirit of John Taylor Arms featured selections from his major series of prints along with independently conceived works. 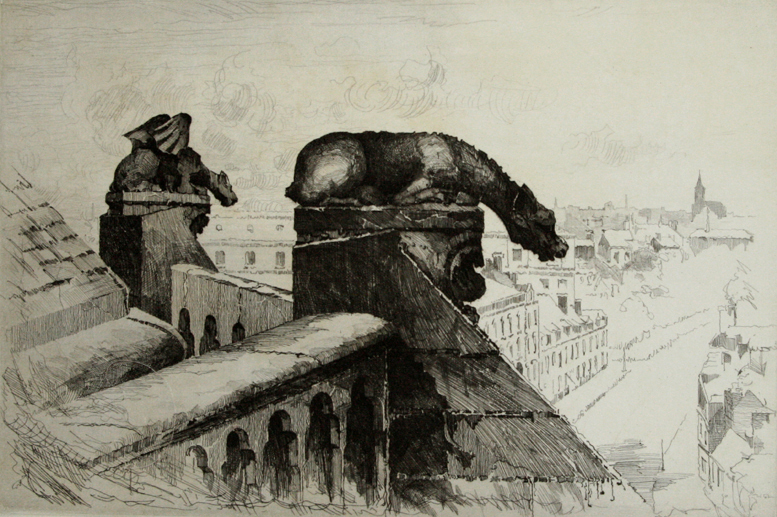 Gothic art and architecture stirred the imagination of Arms, whose earliest Gothic subjects were stone gargoyles that he admired while traveling in France. They are seen in Guardians of the Spire (1921) and A Devil of Notre Dame (1929). Not all of his prints depict Gothic subjects, but all reflect the spirit of an artist whose intense devotion to craftsmanship echoed an association with medieval artisans. Arms would often share his own creative process through technical demonstrations and lectures, and numerous works in the exhibition offer insight into his practice. Drawings and tracings are juxtaposed with associated prints that not only reveal his masterful handling of line but also document the intricate and painstaking craft Arms employed. Arms began his New York Series in 1916, when he was still a practicing architect in the city, and he continued to work on it after his return from WW I. The series reflects his rapid development as a draftsman, moving from a loose, sketchy style to the polished refinement for which he became known. For subjects he gravitated toward structures whose style and ornamentation were expressions of Gothic revival, such as the Woolworth Building and the Brooklyn Bridge, seen in An American Cathedral (1921) and The Gates of the City (1922). A frequent visitor to France, Arms undertook the ambitious plan to document the country's churches and cathedrals. He worked on the series for nearly 30 years, from 1924 to 1953, producing a total of 55 prints. They represent some of the largest and most dramatic images of his career, such as Lace in Stone, Rouen Cathedral (1927), as well as some of the tiniest and most intimate, as in the miniature Black and White, Trébrivan (1953). Between 1925 and 1935, Arms made a series of etchings of subjects he observed during his trips to Italy. With its medieval buildings and variations on Gothic architecture, Venice provided ample inspiration, and Arms' enthusiasm for the city sparked some of the most successful works of his career, including Venetian Mirror (1935). The prints in the English Series were created between 1937 and 1952. They focus on rural settings and feature picturesque villages and parish churches, as in the church seen in Lavenham, England (1939). Destroyers in Wet Basin A sailor during World War I, Arms retained a great love of the sea and ships. His suite of four etchings depicting naval warships was commissioned by the Bureau of Ships in Washington and sold on navy bases during and after World War II. Destroyers in Wet Basin (1943) features the USS Radnor, USS Quick, and USS Mervine in the construction pool of the Federal Shipbuilding and Drydock Company in South Kearny, New Jersey. At the time of the artist's death in October 1953, the copper etching plate "La Trinité," Vendôme was a work in progress. According to Arms' records, he spent nearly 220 hours scratching the design through an acid-resistant hardground with a fine-gauge sewing needle set into a wooden handle. Although the image was catalogued as the final work in the artist's French Church Series, no prints from the plate have been discovered to date. The Gallery's first prints and drawings by Arms came as part of founding benefactor Lessing J. Rosenwald's donation of works in 1943. Subsequent donations were made by Addie Burr Clark, John Davis Hatch, and Mrs. Robert A. Hauslohner. Three of Arms' greatest prints, The Gates of the City, Venetian Filigree (Ca' d'Oro Venetia), and Venetian Mirror, along with corresponding drawings, are partial and promised gifts to the Gallery from Judy and Leo Zickler. A key work, West Forty-Second Street, Night, was acquired for the Gallery by the Donald and Nancy de Laski Fund. Other gifts of prints by Arms have come as a bequest from the artist's grandson, John Taylor Arms IV; as part of the Reba and Dave Williams Collection; and as gifts and promised gifts from David F. Wright.